Aggghhhhh! My fingers! 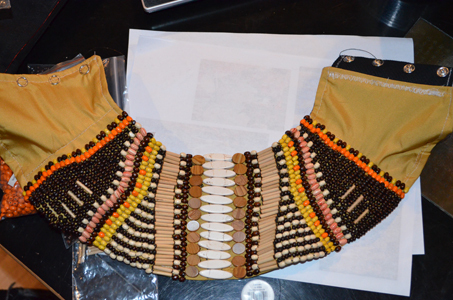 I spent all weekend sewing beads onto my collar for my Lioness costume. There's a good 16 hours of work there. 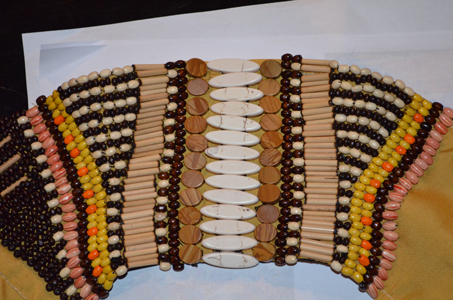 Most of the beads were approximately 4mm-6mm long... so you can see why it would take some time to bead the whole thing! All of the beads are stone or wood (no plastic!). The collar itself was drafted from a duct tape pattern. I used Buckram as a base for stiffness, and covered it with a layer of silk so the buckram wouldn't show through. 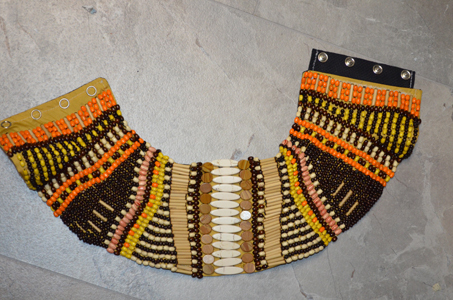 Once I had my collar I began beading from the middle, and worked outwards so I could match the pattern on each side. 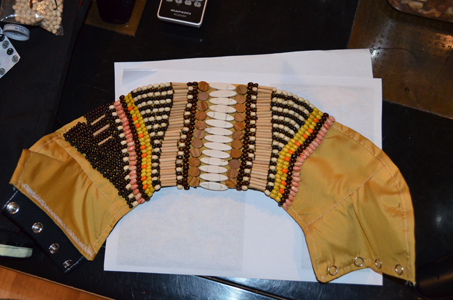 The collar was a nice prep for the corset, which I also have to bead. It is significantly LARGER... however I will be using somewhat larger beads as well.